The tea has been poured, the porcelain admired. 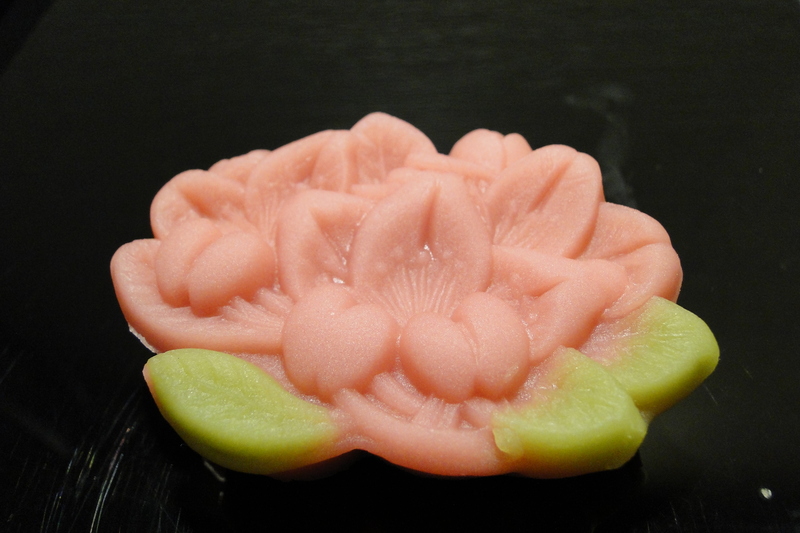 Then the hostess at your tea ceremony lays before you the perfect edible replica of a plum blossom. More than just a casual snack, this portion is a work of art. Welcome to the world of wagashi. Wagashi are traditional Japanese confections, elegant pastries so to speak, which are mainly served during tea ceremonies and on special occasions. You could, I suppose, buy a wagashi to munch on for your walk home from the train station, but it’s not really like buying a donut or a cookie. Wagashi are intricate, known for the delicacy of their designs. It’s a treat to be savored, not devoured on the run. Many Westerners avoid wagashi due to the drastic difference in “dessert expectations”. We already know that most American desserts use a high amount of sugar. So, suprisingly, do some Japanese desserts, but the sweetness seems better balanced by fibrous seaweed “starch” or hearty adzuki beans. Wagashi are dense, an explosion of flavor packed into a small presentation, not light and airy like Western-style cakes. I admit to initially avoiding wagashi and similar treats (like pounded mochi) on account of their being too chewy, too gritty, too subdued in their sugariness. Now, my tastebuds have adapted to the differences and I love seeking out the best wagashi Japan has to offer. In my opinion, you can find some top-notch examples at Toraya. Toraya first shows up in Imperial records from the year 1600 as a small confectioner’s shop in Kyoto. Wagashi has traditionally been a treat of the upper classes, with the Imperial family being a primary consumer. When the Emperor up and decamped to Tokyo at the end of the Edo Period (around 1869), Toraya went as well. The family and their business settled eventually in Akasaka and continued to supply the emperor and his descendants with wagashi; as many traditional craftsmen remained in Kyoto (wagashi makers as well), the lack of competition proved to be a boon. Toraya now has five outlets around Tokyo, though only the main branch in Akasaka serves the Imperial family now. Many wagashi are designed with the seasons in mind. Thus, my April visit saw many cherry blossom themed wagashi in the shop while the next month’s line up was completely different. (I know – I checked. 🙂 ) I have heard that there are 72 distinct seasons in Japan, as recognized by chefs and confectioners (and haiku poets too, probably). As long as all of those seasons contain a different wagashi, I have a long way to eat before I’m through! How much does your typical wagashi cost? I bet the cherry-blossom themed wagashi you bought must have been expensive! Are there quite a few places where wagashi can be purchased in Tokyo? Thanks for the comment. And congratulations on the chance to live in Tokyo next year!! That was the first place I ever lived in Japan and I still absolutely love it. I remember that particular cherry blossom wagashi costing between 400 and 500 yen, which isn’t cheap but it also isn’t exorbitant (as you’ll see when you get here!). Toraya certainly isn’t the only place to buy wagashi but it’s one of the more famous in Tokyo. There are several wagashi shops in Ginza – if you go on a weekend afternoon, they close the main street to traffic and you can just wander up and down the neighborhood, doing some exploration. Also, there are often wagashi outlets in the basements of the major departments stores (where their food floor is located). Isetan (Shinjuku), Matsuzaka (Ginza) and Atre (Kichijoji) are my favorite food halls. I hope you’re enjoying the blog!